History balances the frustration of 'how far we have to go' with the satisfaction of 'how far we have come.' It teaches us tolerance for the human shortcomings and imperfections which are not uniquely of our generation, but of all time. I believe that the fundamental alternative for man is the choice between 'life' and 'death;' between creativity and destructive violence; between reality and illusions; between objectivity and intolerance; between brotherhood-independence and dominance- submission. I have learned silence from the talkative, toleration from the intolerant, and kindness from the unkind, yet strangely, I am ungrateful to those teachers. I have zero tolerance for self-inflicted drama. I respect those who resist me; but I cannot tolerate them. If it was necessary to tolerate in other people everything one permits in oneself, life would be unbearable. 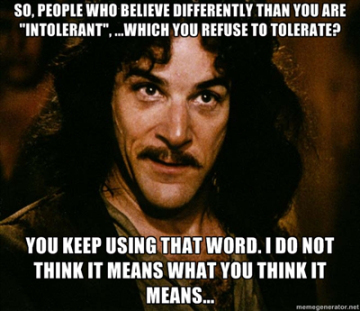 It's a stupid word... tolerance. Stop tolerating in your leaders what you would not tolerate in your friends. The bleak fact is that new tolerances often resemble the old intolerances. In many instances, bitterness over having been 'the oppressed' seems to be little more than jealousy over not having been the oppressor. The evils of government are directly proportional to the tolerance of the people. The perception of poverty as morally intolerable in a rich society had to await the emergence of a rich society. There are three intolerable things in life- cold coffee, lukewarm champagne, and overexcited women. There's no one more intolerant than a liberal in San Francisco. Tolerance does not... do anything, embrace anyone, champion any issue. It wipes the notes off the score of life and replaces them with one long bar of rest. It does not attack error, it does not champion truth, it does not hate evil, it does not love good. Tolerance is an admirable intellectual gift, but it is worth little in politics. Tolerance is just a makeshift, suitable for an overcrowded and overheated planet. It carries on when love gives out, and love generally gives out as soon as we move away from our home and our friends. Tolerance is only another name for indifference. Tolerance: (n) Openness to all ideas from the Left. Tolerating those who will not tolerate you is more correctly known as cowardice. Toleration is a good thing in its place; but you cannot tolerate what will not tolerate you, and is trying to cut your throat. Too much of what passes as tolerance in America is not the result of principled judgment but is simple moral indifference. We should not permit tolerance to degenerate into indifference. We tend to idealize tolerance, then wonder why we find ourselves infested with losers and nut cases. While the American system may be forgivingly tolerant of people with wild and dangerous ideas, it doesn't generally let them run the country. Who teaches you tolerance? Maybe sometimes your children teach you patience, but always your enemy will teach you tolerance. So your enemy is really your teacher. You would not even tolerate for one moment the conduct in an individual that is commonplace in the acts of some nations. You would lock up such a person. Forgot to mention- today is also the birthday of Hunter S. Thompson and Nelson Mandela.